A volute is an ornamental design that originated in classical architecture. In Latin the word means "scroll", which is very much what it looks like. 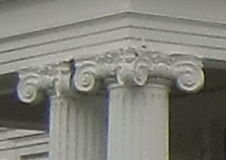 The most common place to find a volute is at the top of the capital of an ionic order column. 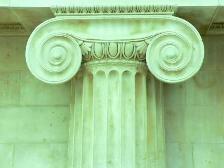 It is the most easily recognizable feature of the ionic order. 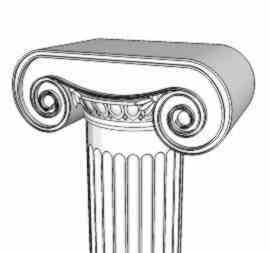 Many Ionic capitals look very much like someone unrolled a scroll partway and rested it on top of the column. Perhaps that is the origin of the order. 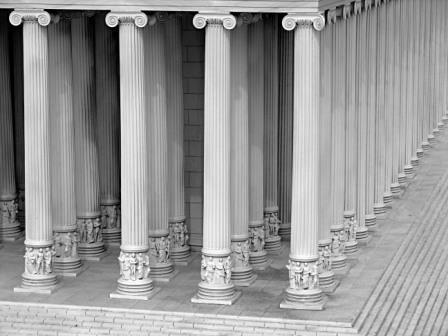 I can imagine some Greek pagan priest placing scrolls on the top of the column right before they set down the entablature to symbolize religion resting upon knowledge, but that is just my theory. No one knows the origin. What is known is that you can find these little curlicues in all kinds of surprising places. It turns out to be a pretty handy ornamental device to have in your design toolkit. It even makes its appearance in nature. 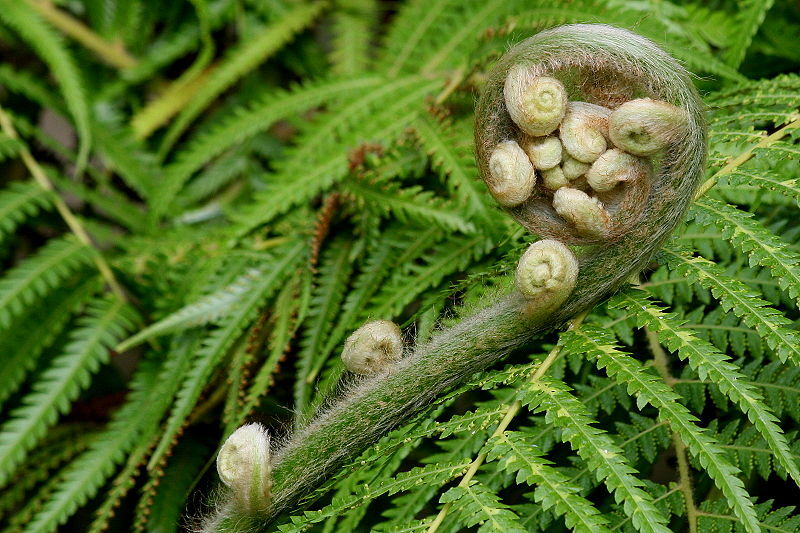 Ferns grow by unrolling like a scroll. Perhaps this is the origin of the design, another example of biomimicry, copying nature for our own purposes. Does art imitate life? This scroll design is a familiar shape to many nature lovers. The shape is not exclusive to classical architects and designers. 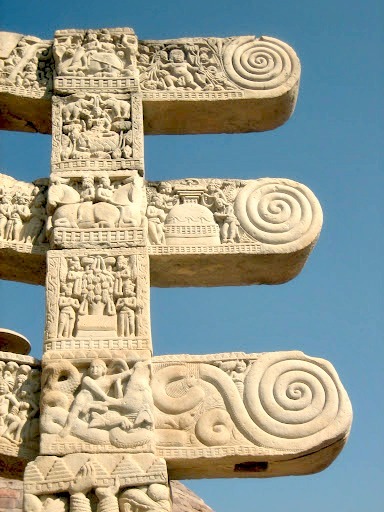 The shape seems pleasing to many artists across various cultures and schools, so it reappears as a basic shape in all kinds of art and architecture. When Art Nouveau and Art Deco where developing artists often borrowed from their existing palette of design motifs, modernizing ancient patterns that were familiar. The volute became a common pattern in both these styles. 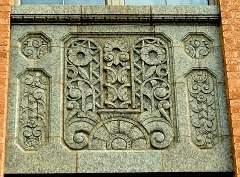 (top) Volutes are the primary elements in this bas relief on the front of the Art Deco style Will Rogers Highschool in Tulsa, Oklahoma. 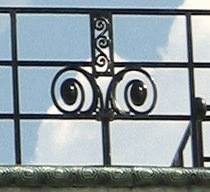 (side) Here is our friend as part of the scroll work on the iron balustrade topping the Art Nouveau style Stoclet Palace in Brussels. Here is a modern Gothic rendition of fern fronds on top of a column grouping supporting an arch. This decorates a small church called Imani Temple in Washington, D.C. 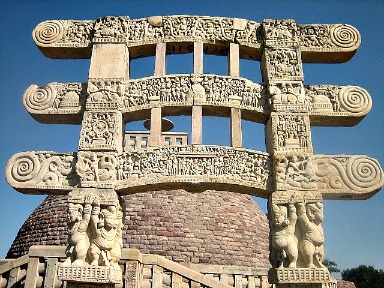 In India the scroll is sometimes used in temple architecture, as in this example from a gate at the Supta at Sanchi. The gate is shown below for context. 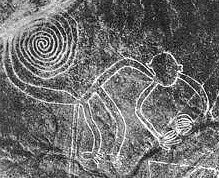 (top) The spiral also looks a lot like a monkey's tail, as witnessed by this geoglyph in the Nazca desert of Peru. 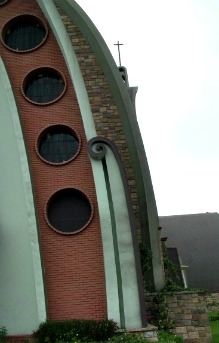 (rigth) Not too far away, in Lima, Peru, the 1960's modern church of Mariallena provides evidence that modernist architects did not entirely abandon decoration.